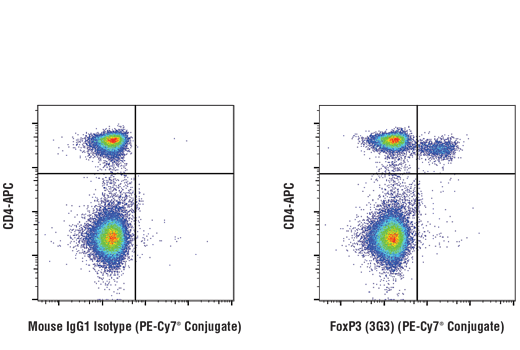 Flow cytometric analysis of live mouse splenocytes using FoxP3 (3G3) Mouse mAb (PE-Cy7® Conjugate) (right) and co-stained with CD4-APC, compared to a concentration-matched Mouse (MOPC-21) mAb IgG1 Isotype Control (PE-Cy7® Conjugate) #79339 (left). This antibody has been validated for Flow Cytometry using the FoxP3/Transcription Factor Fixation/Permeabilization Kit #43481. Please refer to the protocol provided with the kit for detailed instructions. For optimal flow cytometry results, we recommend 0.125μg of antibody per test. Supplied in 10 mM NaH2PO4, 150 mM NaCl, 0.09% NaN3, 0.1% gelatin, pH7.2. This product is stable for 6 months when stored at 4ºC. Do not aliquot the antibody. Protect from light. Do not freeze. FoxP3 (3G3) Mouse mAb (PE-Cy7® Conjugate) recognizes endogenous levels of total FoxP3 protein. This antibody detects an epitope within the intracellular domain. This monoclonal antibody was purified from tissue culture supernatant via affinity chromatography. The purified antibody was conjugated under optimal conditions, with unreacted dye removed from the preparation. This Cell Signaling Technology antibody is conjugated to PE-Cy7® and tested in-house for direct flow cytometric analysis in mouse cells. Forkhead box (Fox) proteins are a family of evolutionarily conserved transcription factors containing a sequence known as Forkhead box or winged helix DNA binding domain (1). The human genome contains 43 Fox proteins that are divided into subfamilies. The FoxP subfamily has four members, FoxP1 - FoxP4, which are broadly expressed and play important roles in organ development, immune response and cancer pathogenesis (2-4). The FoxP subfamily has several characteristics that are atypical among Fox proteins: their Forkhead domain is located at the carboxy-terminal region and they contain motifs that promote homo- and heterodimerization. FoxP proteins usually function as transcriptional repressors (4,5). FoxP3 is crucial for the development of T cells with regulatory properties (Treg) (6). Mutations in FoxP3 are associated with immune dysregulation, polyendocrinopathy, enteropathy, and X-linked syndrome (IPEX) (7), while overexpression in mice causes severe immunodeficiency (8). Research studies have shown that FoxP3 functions as a tumor suppressor in several types of cancer (9-11). Myatt, S.S. and Lam, E.W. (2007) Nat Rev Cancer 7, 847-59. Shu, W. et al. (2001) J Biol Chem 276, 27488-97. Lu, M.M. et al. (2002) Gene Expr Patterns 2, 223-8. Koon, H.B. et al. (2007) Expert Opin Ther Targets 11, 955-65. Li, S. et al. (2004) Mol Cell Biol 24, 809-22. Ochs, H.D. et al. (2007) Immunol Res 38, 112-21. Bennett, C.L. et al. (2001) Nat Genet 27, 20-1. Kasprowicz, D.J. et al. (2003) J Immunol 171, 1216-23. Zuo, T. et al. (2007) Cell 129, 1275-86. Zuo, T. et al. (2007) J Clin Invest 117, 3765-73. Wang, L. et al. (2009) Cancer Cell 16, 336-46. Cy and CyDye are registered trademarks of GE Healthcare.